Floor Illusions are your local Sunshine Coast epoxy flooring experts and we are devoted to creating individual and memorable floors. Our leading floor illusionist is a second generation epoxy installer with a keen eye for detail and a passion for high quality. We believe in complete transparency when dealing with our clients. We take pride in making sure you understand our complete scope of works, from the initial quotation through to the final application of your specific floor. When you employ our services, you’re employing trained specialists who are skilled to deliver any type of resinous, cement based or remedial flooring solution you may require. Our company has been built on stringent workplace practices and we apply the most up to date and innovative flooring techniques available in today’s market, always striving for improved customer satisfaction and quality results on every project, regardless of the size. Our company holds a current QBCC licence, we are a Master Builders QLD member, and all our flooring technicians hold current construction white cards. You might be wondering exactly what epoxy is. Epoxy flooring systems are made up of two main components – resins and hardeners. They are mixed together where they chemically react to form a rigid plastic material that is extremely strong, resistant to degradation and that bonds exceptionally well to its prepared substrate. Our metallic and liquid marble effect floors are cutting-edge. These finishes range from elegant to exotic and are one-of-a-kind creations. These floor systems offer an unmatched blend of beauty and style. Nano-pigments are dispersed in a variety of binders (resins) to create a seamless and unique, three-dimensional appearance that catches and reflects the light. Even though metallic floors look like a million dollars, you will be surprised just how affordable they are. WHAT ARE THE BENEFITS OF RESINOUS & SPRAY ON POLYMER-CEMENT FLOORS? Epoxy flooring systems are formulated and installed based on the customer’s exact requirements . When correctly applied, epoxies produce an extremely hard, chemical, oil and solvent resistant finish. The end result is waterproof and can be optioned with a non-slip surface. There are literally 100’s of colour and texture options to suit any decor or space. We can also supply and install water-based and Green Star/low VOC coatings and resins with low odour and no harmful emissions. True polished concrete is achieved by grinding the concrete surface with diamonds to reveal or expose the aggregate within the slab. New and existing concrete can be ground and polished to reveal partial or full exposure of the aggregate. Grinding with progressively finer diamonds produces the gloss/satin polished finish. A non-slip rating can also be achieved with polished concrete floors. Our finished floors are extremely easy to keep clean with their seamless finish, plus our floors are very hygienic as they don’t harbor bacteria or dust (very useful for asthma sufferers). Generally speaking warm soapy water with a microfiber mop will do the trick; for a deeper clean on anti-slip surfaces you can scrub with a broom and the hose if required. WHAT IS THE DOWNTIME WHILE MY FLOOR IS INSTALLED? Depending on what flooring system you choose to have installed there are varying installation, curing times and trafficable access periods ranging from 3-4 hours and up to 7 days, but generally speaking most floors are completed in 2-4 days. WHAT IS A FLAKE FLOOR? These floors are epoxy based but they actually have colored chips or flakes laid within the floors for decoration. The flakes also provide a slight texture to the surface that provides good anti slip qualities. Resurfacing is designed to create a decorative finish on new/existing concrete and bitumen surfaces. Concrete resurfacing systems are technically known as ‘polymer modified-cement based coatings’. 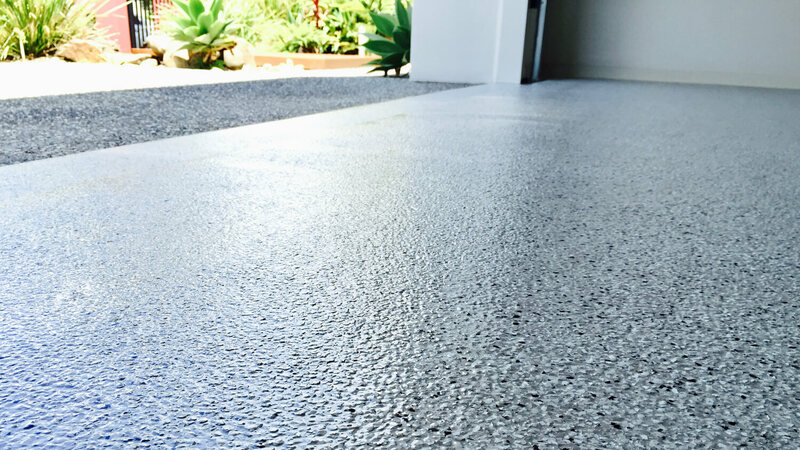 Spray-on resurfacing compounds penetrate and bond rigidly to the existing concrete substrates and help create a slip resistant, textured, stylish surface with excellent durability and abrasion resistance. These designs are state of the art flooring systems. Our Sandstone or rustic wood overlays are achieved using concrete resurfacing products. Each plank of wood or sandstone tile is individually handcrafted and designed. The overlay is then sealed with a variety of Polyurethane, Acrylic or Polyaspartic topcoats to achieve a matt, satin or high gloss finish. WHAT IS A FLOOR LOGO/MOTIF? This can be the pinnacle design feature of an office, workshop or factory reception area. Using a high quality printed material and epoxy or polyurethanes, we can sink your logo into a clear resin floor. Your logo will be seamlessly integrated into your floor, with no curling edges or fading to worry about. These floor logos will last as long as your building is standing. Generally a One-year guarantee on Products and Workmanship are given on all our flooring systems. Additional warranties can be discussed if required.